help! The Zombies are back! HELP! Zombies have invaded Professor Qwbli's again and this time they are trying to ruin Halloween! They were defeated last Christmas but I think we left a bad taste in their mouths because they are back for revenge! Can your team find the tools you will need to defeat the zombies that are scattered throughout downtown Traverse City in time to celebrate the Halloween with us? It's going to take a lot of teamwork, smarts, and perseverance! To defeat the zombies you will need to solve A LOT of CHALLENGING, interesting, fun puzzles! It won't be easy and it will take your entire team! IF you are successful, we will celebrate with a Halloween Happy Hour! If not, well, you'd be zombies and you'd be dead. Pity! More beer for us! 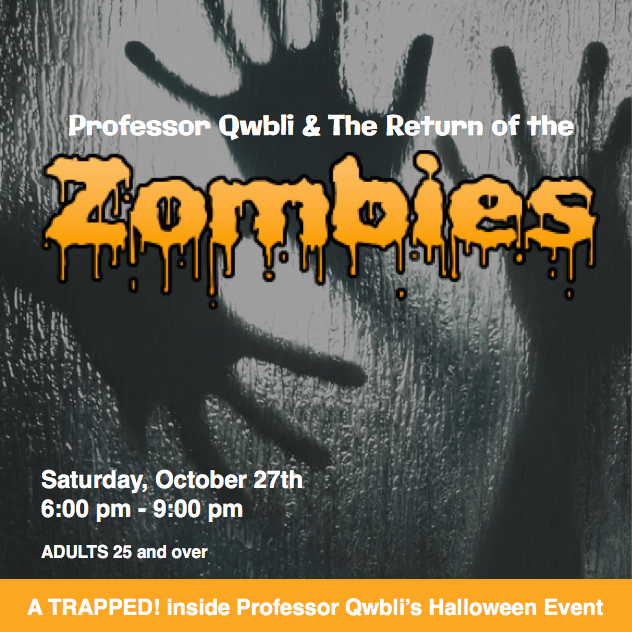 Please join us for this special Halloween ADULT escape room event - Professor Qwbli & The Return of the Zombies*. ADULTS 25 and over. Includes beer, wine & pizza.